Philip LeFevre, was the second son of Isaac LeFevre and Catherine Ferree. He received this land from his father, Isaac, who acquired land for each of his four sons. Philip's tract located on Hans Herr Drive about three miles northwest of Strasburg in West Lampeter Township contained 350 acres. 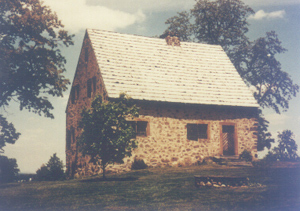 It was deeded to Philip for the consideration of "natural love and affection" The stone house on that land was built in 1719 by Christian Herr, son of Hans Herr. 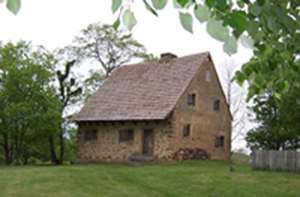 It is said to be the oldest surviving dwelling place in Lancaster County. It was home to several generations of the Hans Herr family including Philip LeFevre and his wife, Mary Catherina Herr, the daughter of Christian Herr. Besides serving as a dwelling, it has also been used as a Mennonite Meeting House, a shelter for local Indians during winter storms, a barn, and a storage shed. It was restored in the early 1970s and is now owned by the Mennonite Historical Society and is part of a museum complex. Philip LeFevre was born March 16, 1709/10 and died September 1761. Lineage: Philip LeFevre and Mary Catherina Herr/ Isaac LeFevre and Catherine Ferree/ Daniel Ferree and Marie Warenbur. Sources: "Lefevre Historical Spots" by Art Glenn, www.artglenn.com/family/Lefevre; "The Pennsylvania LeFevres" by George Newton LeFevre, www.pennsylvanialefevres.org/book/records1; "The 1719 Hans Herr House & Museum Website" , www.hansherr.org.